It is almost every little girl’s dream to own a customised Doll House painted with her favourite colours and filled with her favourite toys. Boys might prefer a miniature casino. A Doll House is easy to make at home from the structure of the actual house to the décor and tiny furniture. Because girls love colourful things, the Doll House can have different brightly painted rooms, making the playing experience even more interesting for the little one(s). If you are short of imagination, ask your children how they would prefer the Doll House to look. 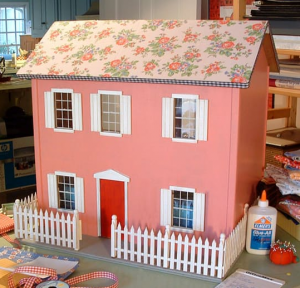 Additionally, the Internet is also full of beautiful homemade Doll House designs for inspiration. Here are the two basic options for an affordable and easy-to-modify Doll House – the Cardboard Doll House and the Wooden / Chipboard Doll House. A Cardboard Doll House is probably the cheapest and fastest way to put together a miniature house. For the rooms, simply use cardboard boxes with the top / lids cut off and place them on their side next to and on top of each other – the number depends on how many rooms you wish the house to have. They can be glued together using strong household glue. Doorways and windows can easily be cut out with any sharp knife, although a carpet knife works here the best. The Cardboard is easy to cut and design other structures such as stairs into the Doll House. Remember to paint the walls. Alternatively, you can use leftover pieces of real wallpaper on the walls, which are often sold cheaply at décor shops or you could also just use any colourful craft paper with nice prints on it. The little furniture can also be made from the cardboard and with a little paint and fabric covering, such as small pillows and sheets the cardboard furniture can be turned into realistic and exciting décor. The small leftover pieces of fabric also make perfect curtains and carpets for the Doll House. 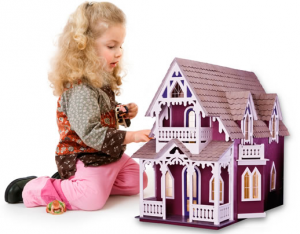 Whereas wood and chipboard might not be as easy to cut, handle, and paste as cardboard is, they will definitely make a more durable Doll House, which will last through years of playing. A Wooden Doll House takes a little more planning and measuring. Nevertheless, the material will be almost as affordable as for a Cardboard Doll House. Leftover wood pieces are sold cheaply and chipboard, which makes perfect walls, floors, and a roof for a Doll House, is also very affordable. Little pieces of wood can easily be turned into small furniture, which can be put together with wood glue. Remember to refine the wood surfaces with sandpaper before painting to ensure the Doll House is safe for little hands to play with. Because a Wooden Doll House will last for years, it is important that the height of the rooms from floor to ceiling is high enough to fit all the toys you can think your child would like to play with in the house. A practical tip is to make the height enough for schoolbooks so that once the child has outgrown the Doll House and they could use it as a unique bookshelf.